With its uniqueness, Bong culture catches every art, music, and history buff’s attention. Be it the yellow taxis or the police uniforms, be it the Kolkata biryani or the football culture, you cannot escape falling in love with its old world charm. But there’s more to it than just sweets, football, and fish. There are places to encapture you with their beauty, pulling you into an oasis of serenity. Reaching the spot you are sure to be charmed with its scenic beauty. Welcome to West Bengal – the other side of it! Let us walk you through it! One of the most untouched, pure forested Havens of the planet, a rugged, remote paradise, it draws all types of visitors, particularly the adventurous and creative types, with boho shops, welcoming cafes and an outstanding street food culinary scene. Lamahatta offers a tranquil atmosphere for all those looking for some peace away from city life. Nature will cleanse everything and you will be refreshed after having that garden fresh Darjeeling tea. 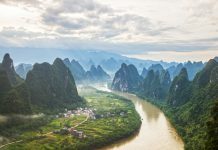 They make their way through the high plateaus to the edge of the heaven, discovering monasteries, nomads, meditation caves, monks and Buddhist traditions along the way. The deeper you travel, the deeper it seems you go within yourself to discover what your soul is truly in need of. The Roadside Garden is one of Lamahatta’s major attractions. This is a sprawling manicured garden on the roadside with many flowering plantations, hedges, pathways, seating places, and a gazebo for prayers or meditation. It is surrounded by pine forests containing numerous seasonal flowers, as well as several rare and exotic species of orchids. Browsing through the beautiful array of flowers on display, visitors can also relax on the numerous benches while enjoying the views of Mt. Kanchenjungha. The watchtower is located at a strategic location that helps visitors to enjoy panoramic views of the juncture of Mt. Kanchenjunga, Sikkim Hills, River Teesta and the River Rangeet. Colourful flags dance in the winds at one side of the garden. The locals say that the breeze passes through these prayer flags and purify the surroundings as well as the souls of the people. 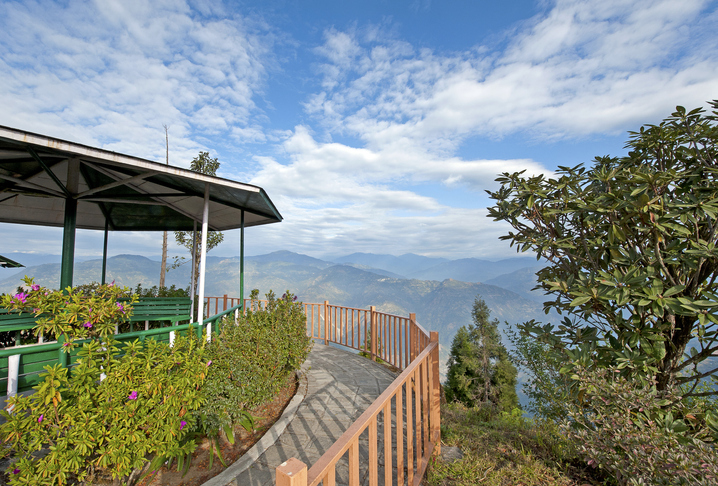 Some of the best views of the Darjeeling hills are seen from the garden. On a clear day, you can see the surrounding ranges, the valley and the Rangit river flowing down. Misty meandering roads, chirping of the birds, nature trails passing through dense forests, sound and sight of fountain streams coming down the slope of mountains with every few steps and turns you walk – this is what Takdah is. Takdah Cantonment has an orchid centre where a variety of rare Himalayan orchids are cultivated. The centre has been a favourite among tourists visiting Takdah for ages. The lush tea garden landscapes surrounded by mountains and Teesta flowing far below makes for a stunning ambience. The market area leads to a steep stairway beyond which you might have to climb several flights of stairs to reach up to the Monastery. 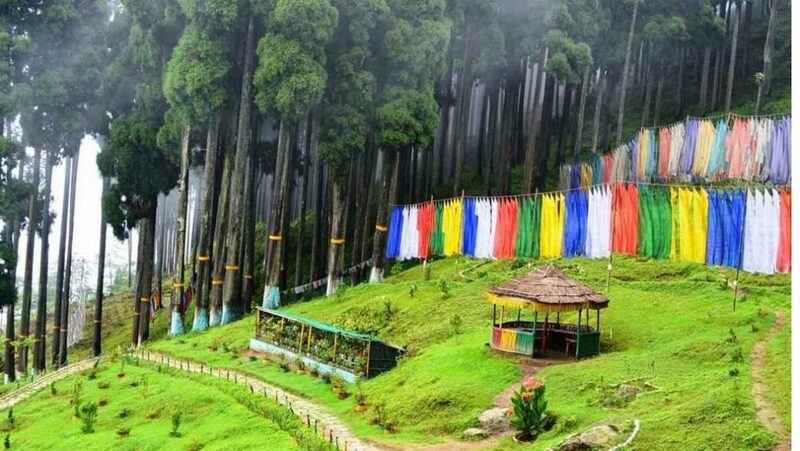 Kalimpong is a green and untouched hill station in West Bengal popular for its panoramic valley views, Buddhists monasteries and churches and Tibetan handicrafts etc. Located at a distance of 50 minutes east of Darjeeling, it’s a hill station on the foothills of the Shivalik ranges (altitude of 1250 m) overlooking the Teesta Valley. It is said to be historically ruled by Bhutanese kings. With a few ancient Buddhist monasteries here and there, centuries-old churches and exquisite revered temples in Kalimpong also marks the Bhutanese history till it was wrested by British rulers. Some other famous places to visit are Jang Dong Palriffo Brang (Monastery) and Thongsa Gompa (Bhutanese Monastery). A worthwhile visit would be to the flower markets that are famous for their orchids and lovely bright flowers. Teesta River with its green surroundings is the best choice for Rafting in Kalimpong. The rafting trips along the Teesta river starts at Melli Bridge and culminates at Geilkhola in Kalimpong. The land of the largest number of commercial flower nurseries, Kalimpong nurseries specialize in the cultivation of exotic beautiful flowers and export these flowers to different parts of the country. There are innumerable nurseries across the town so you can enjoy some sweet time there. Pine View Nursery which is famous for exotic cactus, is highly popular. Built in the typical Buddhist architectural style, this monastery has sculptured walls, pillars and ancient paintings. In addition, this gompa houses the main prayer hall with large paintings and has a three-dimensional appearance inside. Durpin Monastery holds an important religious significance owing to sacred Kangyur kept inside the monastery. Consisting of 108 volumes, all these were carried by Dalai Lama during his exile. Some of the rare documents related with Buddhism are found within the Zang Dhok Palri Monastery. Perched at an elevation of around 1372 m, one can spot the breathtaking views of the snowcapped Kanchenjunga and the Pristine Teesta River flowing down below. The nature interpretation centre (also known as forest museum) is over a century old, established and maintained by the forest department. Want to know how and which human activities contribute to the various environmental issues that are ruining our planet? This is the place to check out that information. The dioramas on display will also give you an insight into the ecology of Kalimpong. You can learn something about sustainability here. Another place you must visit is the Haat Bazar of Kalimpong. It’s basically a village market which is set up weekly on every Wednesday and Saturday between 7 am to 6.30pm. It can be reached from Rishi road. Villagers coming from nearby areas in their colourful village costumes is a common sight. So is the thriving business of vegetable farm products, spices, clothes, umbrellas, bags and more. You can get a chance to try out local street food like momos,phambis, alu thukpa etc. Although they look cool, they are some of the hottest chilli peppers I have ever had. But they add a great taste and aroma when used in curries or Chinese dishes. Fresh ones can be bought at the Haat Bazaar and also with local roadside vendors. Ask any locals and they will vouch for this. Previously a Swiss Dairy in Kalimpong was highly popular which no longer exists. It is said that Catholic Swiss priests originally introduced this rich cheese and showed the method used to make such mouthwatering cheese to some locals. The tradition is still practised and you will get them in Kalimpong all through the year in several stores. This is also known as Glass Noodles. Locally made noodles available in packets. Made by the cottage industry in Kalimpong during the dry months of October to June, it tastes super different and great – don’t forget to take some back home. There is a lot of Tibetan population in Kalimpong. Over time, the Tibetan art & handicraft industry has flourished here. You will get items like Thankas which are intricately made religious scroll paintings, woollen garments, various wood crafted items serving as great souvenirs, tapestry bags & purses etc. ‘Queen of the Hills’ Darjeeling is situated in the northern part of West Bengal. The picturesque sceneries of this small hill station are enough to be an everlasting part of your mind and heart. 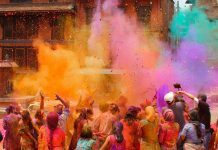 This place is best known for old Buddhist monasteries, sprawling estates with tea plantations, ride on the chairlift, shopping in the colourful markets and trekking to high altitude spots. Famous as the most magnificent hill resorts in the world, Darjeeling has a unique feature of the toy train, which takes you from Jalpaiguri to Darjeeling through scenic valleys. Land of Thunderbolt is Darjeeling for you. You get to enjoy the thrilling but memorable Singamari ropeway tour and make memories to see the sprawling tea gardens from the height of 300-400 meters above and to cherish your Darjeeling tours for a lifetime. You will be left awestruck once the chair starts moving slowly down to the Singla Bazaar and the colour diversity hits you. 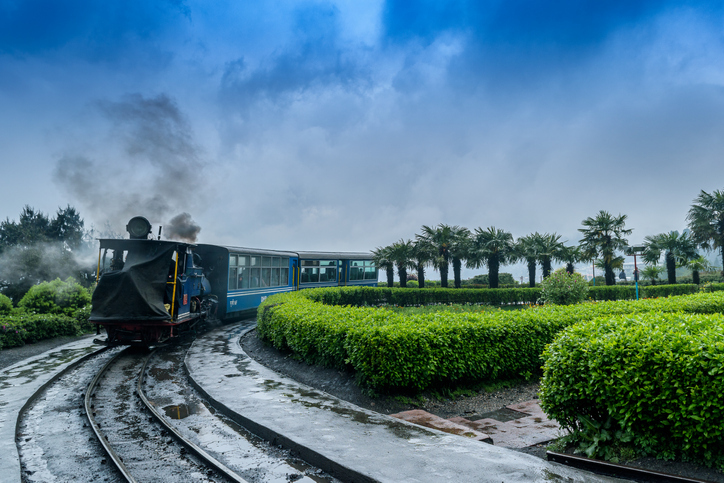 If you want to experience the real toy train ride, as an adult or a kid alike, traversing through the zig-zag mountains paths and scenic beauty of Mother Nature, then you must visit Darjeeling and take the toy train ride. Dhirdham Temple is situated near Darjeeling Railway Station. The temple architecture was inspired by the famous Pashupatinath Temple at Kathmandu in Nepal. There is a statue of Lord Shiva outside the main temple which depicts “Pancha Bakram Tri Netram” which means five different facial expressions of Lord Shiva in different moods and the third eye. While in Darjeeling a visit to any nearby Tea Garden to watch the actual process of the manufacturing of Darjeeling Tea is worth it. Few of the Tea Gardens also sell their processed packaged tea bags. There are around 70 tea gardens with the most accessible one being Happy Valley Tea Estate. Must have foods – Tibetan Cuisine For all! Served with hot soup on the side, momos are undoubtedly one of the best snack foods. Generally, 6 to 7 pieces of momos and a bowl of soup are served on one plate. Momos are one of the classic foods of Tibetan cuisine. The Momo dumplings are made of flour dough which is stuffed with vegetables in case of vegetarian ones and pork or chicken in case of non-vegetarian ones. Thukpa is also a talked about dish of the Tibetan cuisine widely available in many restaurants and roadside shacks of Darjeeling. This is actually a kind of starter, but for an average eater, it is no less than a wholesome meal. It is hot noodle soup with vegetables, light spices, meat and Hakka noodles. Pro tip: Try the food at Devekas and Kunga located on Gandhi Road. When we get out of the glass bottle of our ego and when we escape like the squirrels in the cage of our personality and get into the jungles again, we shall shiver with cold and fright. But things will happen to us anyway – so that we get to know ourselves. Cool, unlying life will rush in.